← I have questions too! Australia didn’t get serious until their 6th year of drought. Two more dry years to go! We spent a lot of time looking to Australia for answers during the last drought. My conclusion after listening to a series of Australian visitors was that they don’t actually have much to offer us. I can use a couple of points from these articles to illustrate why. Grant said one of the things he found interesting was the simplicity of one effective tactic—electronic billboards that flashed reservoir levels. A regional water manager had the power to force water utilities, city agencies and reservoir managers to cooperate. The Australian guy touted their water market and re-do of their water rights scheme, but when I asked him what they did about the takings issue, he didn’t know what “takings” meant. When I explained it, he said that it had never come up. At that point I was done learning about drought management from visiting Australians. All of Australia’s urban water use efficiency is very nice and California should copy the good parts. There isn’t a good role for household cisterns here because we don’t have a monsoon climate. But let’s point out what Australia really did. They talk big talk about modernizing their district-level irrigation delivery systems (all those new gates for a billion dollars; I do wonder how all those moving parts are holding up) and their water markets. But those are just mechanisms. What they did was fallow half their irrigated ag during the drought. A third of their irrigated ag is still retired. It took me a lot of looking to find this, but here are the stats from the Australian Bureau of Statistics Series 4610 (and also 4618). And 2012 was apparently an extremely wet year. 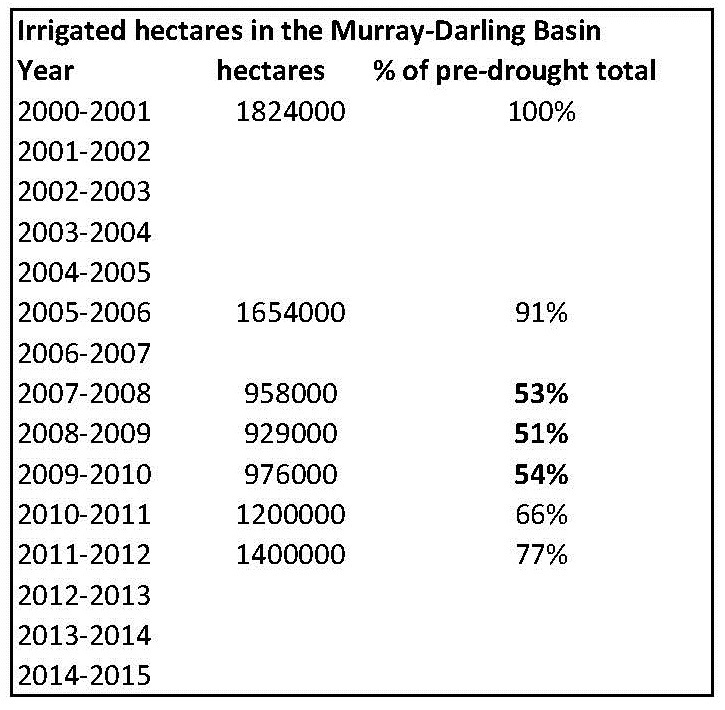 The Murray-Darling Basin has no groundwater. When surface water went away, they lost half their irrigated hectaresacreage. Farmers here claim that a 6-8% loss of irrigated lands is a big deal, but when California gets serious about living within our annual water supplies, I predict something similar. We could look at Australia’s example for ways to do that, although frankly, even their water market doesn’t seem to have been a subjectively pleasant experience for Australian growers. I would like for us to do better by our growers, but so far we don’t even admit what is happening. Not to mention that the MDB has essentially one area of intense water use, and it’s at the bottom of the basin where the water flows anyway. It’s way easier there to move water according to market demands than it would be in ANY Western state. I really liked your post on the physical difficulties of moving water in a market. IIRC a lot of that MDB land has been permanently fallowed via a government buyout program. You are generally correct. There is not much that California can learn from the Australian drought that is applicable here. But it’s not correct to say that the MDB has no ground water. The MDB and the Great Artesian Basin actually overlap in the NSW – Queensland border region and where I used to spend school holidays in Western NSW there are windmill driven pumped wells that provide drinking water for sheep. But I think you are correct in suggesting that in the irrigated farming areas along the Murrumbidgee and the Murray there is essentially total reliance on surface water. Also, Santa Barbara is connected to the State Water Project. The locals complaint is that what they have to pay for that connection is excessive for the little water they get out of it. Actually, no. Australia had a HUGE agricultural reform in the late 1980s and (intrastate) water trading started in the 90s, so they had a lot of experience when the drought got worse. Their decision to swap “rights” for “licenses” was also critical to (a) protecting enviro water flows and (b) simplifying the market.